Beautiful Gulf front unit at Oceania with an expansive 60 foot wide balcony that looks out onto the pristine beaches and emerald green waters of the Gulf of Mexico. This unit is just under 2,000 sq ft & has floor to ceiling glass windows & doors that span across the entire front of the unit creating a panoramic Gulf view throughout. This is an elevated 1st floor unit so the views are stunning and you can even hear the surf. Raised ceilings & an open floor plan make this unit feel palatial. The kitchen and wet bar have been upgraded with matching granite counters and tile back splash. All bedrooms offer en-suite bathrooms and are generous in size. The huge Gulf front master bedroom opens onto the private balcony, has a large walk-in closet and en-suite bath with whirlpool tub to unwind in!The unit is being sold fully furnished & decorated and is ready for the summer rental season - these are definitely income producing properties with the private bedrooms and larger size than general condos. The kitchen and dining area offer great Gulf views and make entertaining easy. The stainless appliances are new and the wet bar includes a refrigerator with ice maker. There is plenty of storage in this 3 bedroom condo, with 2 owner's closets and a huge laundry room equipped with a full size washer & dryer. There is a large storage room just outside the unit to store all your beach gear and an additional storage unit closer to the elevator. With covered parking and amazing amenities, this is luxury living on the coast. This amazing Gulf front condo is turn-key ready to become your profitable beach vacation rental, however one look and you will want to make this your full time residence! 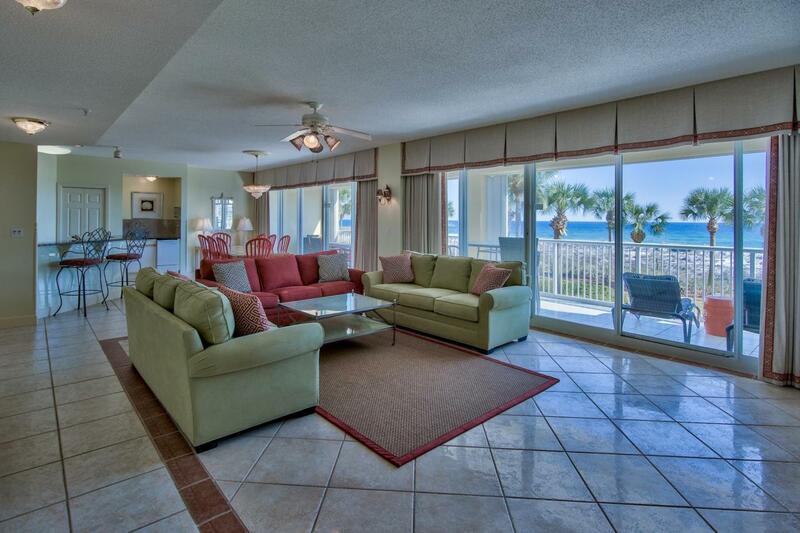 Oceania is located right on the beach on legendary Holiday Isle in the heart of Destin. The community is gated and features a gulf side pool and exercise room. The lobby & poolside owner's lounge was recently renovated for a contemporary look. Relax in the sand, at the pool, or enjoy the stunning views from your balcony. Located on Holiday Isle in the heart of Destin, you are just minutes from all the dining, shopping and entertainment you could ask for in your new beachfront retreat.